What sets Miss Green apart from its counterparts in the world of workday lunch break choices is that all the ingredients are gauranteed to be 100% organic. This is not to say, however, that all the menu items are bio. One can still grab a "Coca" with their lunch menu, but other than that all entrée, plat, and dessert options are organic. 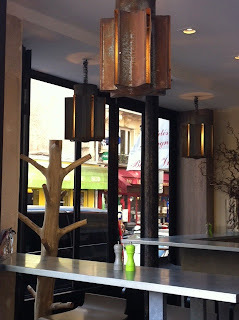 While I would prefer to lunch at a more unique and entirely organic fast-food option, such as Bio Burger , Miss Green does offer an alternative to the run-of-the-mill lunch spots that serve the bustling and business-oriented Ternes neighborhood in the 17th arrondissement. Instead of paying a similar price at a chain bakery like Paul, here one can grab an organic alternative. 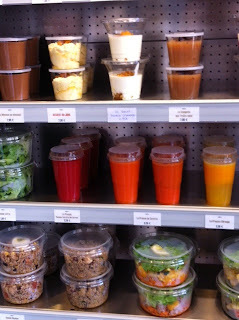 The spot also offers a wide selection of salads and hot dishes, such as pasta and gratins. Vegetariens won't have to settle for a cheese sandwich at Miss Green, making it a worthwhile address for herbavores to keep in mind. Every offering on the menu, from sandwiches (3.90-5.40 euro) to salads (5.90 euro), tartes (6.40 euro), and plats chauds (6.90 euro) includes a filling vegetarian option. When I visited, one of the plats du jour was a vegetarian lasagna. 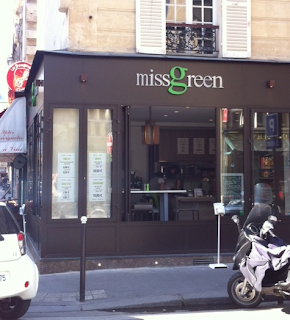 Miss Green, which has been open for just under a year, may not benefit from it's location on a side street off the busy avenue des Ternes- it was very quiet the day I visited early on a Monday afternoon. However, the location is well chosen in the sense that it is right across from the Marché des Ternes. On market days (Tuesdays-Sundays) I imagine the airy and welcoming dining area of Miss Green fills up with shoppers and the quartier gets livelier. The restaurant is also working on a system where locals can order their lunch on-line and have it delivered. The online ordering system will make it hard to find an excuse not to opt for organic even on the busiest of work days. While the menu is basic and doesn't stray from traditional lunch options in content, Miss Green offers an upgrade in quality to anyone looking to integrate more organic into their life.